Centipedes form the class of arthropods known as Chilopoda. These distinctive creatures have several adaptations that help them thrive in nature, including poison claws, numerous legs and a nocturnal lifestyle. Additionally, centipedes are able to live in a wide variety of environments and can grow to large sizes because of their evolutionary success. All centipedes have one thing in common: their forcipules. No other creatures have these distinctive adaptations. The forcipules are modified legs found right behind the centipede's head. They operate as pinchers that grab prey and inject it with venom that passes from glands into a tube in each of the legs. These forcipules can take down many types of prey, including spiders, insects. 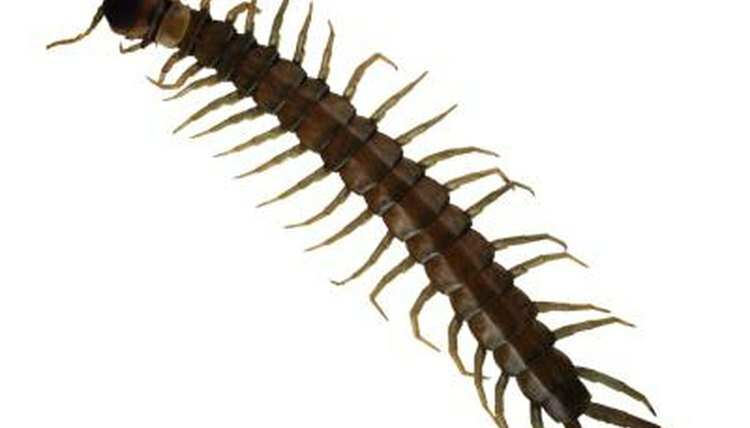 Because these are not really part of the centipede’s mouth, if you are “bitten” by one of these creatures, you are actually just being pinched by its forcipules and, possibly, injected with its venom. Centipede venom contains a number of different chemicals, including serotonin, histamines, and acetylcholine. In humans, the histamines can cause an allergic reaction, particularly in people who have sensitivity to the venom of insects. The serotonin causes intense pain, particularly when the venom comes from one of the larger centipede species, such as the Amazonian giant centipede, which can be over 12 inches long. This venom serves as another adaptation that allows centipedes to easily kill prey larger than itself. The Amazonian giant centipede, for example, eats frogs, mice and bats. This arthropod’s name literally means “100 legs,” even though members of the Chilopoda class can have anywhere from 15 to 177 pairs of legs. Each of the centipede’s body segments has its own pair of legs, and more segments are added to the centipede’s body as he continues to molt and grow. The real advantage of having so many legs is speed. Centipedes travel fast, so they are hard to see and even more difficult to catch. This speed means successful predators must be faster or smarter if they want to use centipedes as food sources. Centipedes have adapted successfully to a wide range of environments. For example, the giant desert centipede (Scolopendra heros) and the common desert centipede (Scolopendra polymorpha) live in the desert. They hide from the heat and scorching sun during the day then hunt for food at night. Other centipedes, such as the wood centipede (Lithobius forficatus) have adapted to cold weather by developing a tolerance to freezing. The study "Freeze Tolerance Adaptations in the Centipede, Lithobius Forficatus" published in the April 1994 Journal of Experimental Zoology found that wood centipedes could inoculate themselves against freezing to survive the winter. Most centipedes stay in dark, moist areas where food sources are plentiful. They tend to have simple eyes or no eyes at all. Even the species that have compound eyes do not have very good vision. Instead, centipedes rely on their antennae to sense potential prey. The sensitivity of their antennae is more effective than their eyes would be at locating food in these dark environments, and this adaptation allows them to hunt for prey without exposing themselves to their own predators.